Synopsis: Lupin reels from his loss to Albert, barely escaping with his life, but the DGSE director is himself immediately targeted and the notebook is stolen by assassins. However, instead of turning it over to Guillaume, the band of butchers instead hand it to a right wing politician running on an anti-immigration campaign. 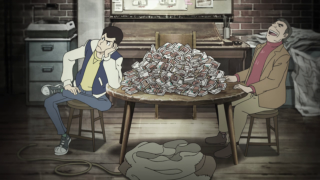 Despite losing the notebook, Lupin, Jigen, and Goemon are relentlessly pursued by the killers. Both Lupin and Albert decide taking the initiative, coming face to face at Guillaume's residence, where their goals overlap. Have they gone from rivals to associates or is this team up temporary? It's an explosive chase for Lupin that tests his limits! 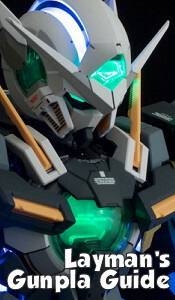 Well, this certainly got a lot more complex, now didn't it? 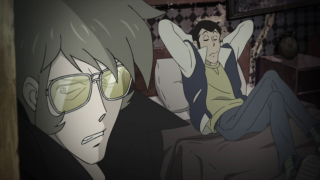 First, clearly the relationship between Albert and Gillaume is adversarial, given that his goon squad attacked our bifocaled bandit as soon as Jigen and Goemon escaped with the injured Lupin. Gullaume is clearly looking to use the contents of the notebook just like Albert is, to climb the ladder further, likely through blackmail of higher authorities, so they're both rivals in obtaining it. He's more than willing to send his hit men to retrieve the book and/or kill his rival. I wonder if that makes him more or just equally as underhanded as Albert? Given that Lupin was going to blow Albert up, nobody here is entirely clean. The major parties all have an angle. An added wrinkle is that the killer team (Jose, the sharp-toothed Hot Topic lady, the masked one, and the moe girl collage) decides to keep the notebook, or rather, hand it over to another party altogether, a politician. 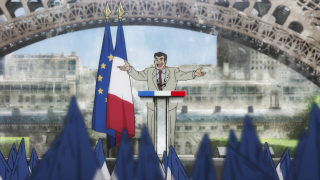 This politician is a right wing politician named Calvess, who is running for President of France on a virulent anti-immigration platform, and may actually be manipulating the so-called terrorist attacks by the "Cry For Truth" group (if not outright organizing them to push his cause). He's barely had any lines and I already hate this guy, a right wing reactionary in the style of Marine Le Pen, or more domestically, Agent Orange. You can't get more politically relevant if you tried. It makes me nervous, though, since the Japanese aren't really known for their enlightened views on immigration themselves, but I don't think this "Eye of the Storm" guy is being painted positively thus far. My own biases should be noted, as in full disclosier, I am quite left-wing. Much more left wing than Macron, who is essentially the French Barack Obama. Not only is there a political wrinkle, but also a bit of information about Lupin and Albert's shared history. Apparently they were old thieving rivals back in the day, but Albert, spurred on by Lupin's devil-may-care attitude, dreamed of a bigger score: he wanted to steal France itself. An odd line in one of the flashbacks, though, I find even more interesting. Apparently "Lupin the Third" is an inherited title, rather than Lupin's actual name, if I understand that scene correctly. He and Albert were possibly competing for that title? 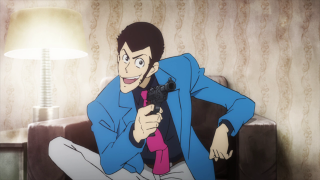 This uses the Green vs Red "Lupin The Third is just the current guy to deserve the name" theory of Lupin's longevity, which frankly I dislike because we were never before meant to believe that he was anything but the original and only Lupin III. After all, doesn't that mean there've been several Jigens and Goemons? Or perhaps all this means is that the Lupin we see here, while inheriting the title, has been the only one ever before to do so? I'm going to give this a little latitude, so I hope they explain this. The extended chase scene in this episode stays exciting and refreshes itself so that it never outstays its welcome. 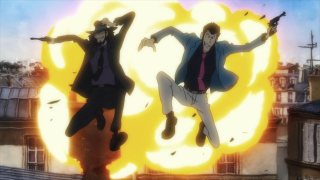 That shot of Lupin and Jigen jumping through the window that Goemon had previously crashed out of was inspired, reminding me of that first chase in Jigen's Gravestone. I love the bit where Goemon jumps into the sidecar and promptly puts on a helmet (safety first, guy who jumps out of fourth floor windows)! Shortly after this, he cuts the sidecar off to battle the masked assassin. And of course that jump on the motorcycle where Lupin and Jigen get pulled down by Moe Collage was amusing. There was some pretty damn good action in this episode. 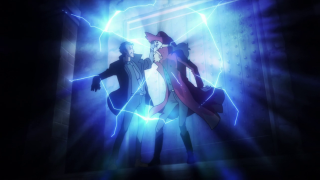 It seems like whatever went on in the past, and even just in the previous episode where Albert seriously injured him, Lupin's goals are intersecting with the clever DGSE director, and they can both benefit from shaking Guillaume down for information. This is now bigger than their feud. A fantastic episode. This series may turn out to be my favorite in the franchise if it keeps up this level of quality.